For detailed information about our current courses please select the course of interest from the above menu. If you are interested in something else why not give us a call to discuss your requirements. Our instructors are able to deliver a wide range of qualifications not all of which are listed on the web site. The majority of our courses are delivered at our private lake in Taplow although we do use the Jubilee River and the Thames to add to the experience. Once you get to three star level we do travel a bit further, pretty essential really if you want to qualify in Whitewater Kayaking or Sea Kayaking! 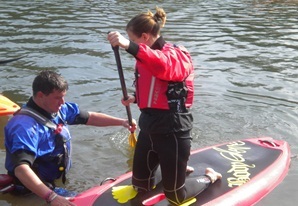 The British Canoeing Paddlesport Instructor award is designed for irunning paddlesport taster/starter sessions within clubs, centres or other organisations in very sheltered water environments and in craft suitable for a first-time experience. Your Discover Award allows you to develop your decision making and practical skills for a fun and safe time on the water, taking you on the next steps towards becoming a proficient and independent paddler. This is a one day course the aim of which is to provide the student with the key safety and rescue skills required to operate safely in a sheltered water environment and to be able to deal with common emergencies. The Touring Award is designed to develop your ability to apply appropriate decision-making skills to an enjoyable and safe day out touring on a river or estuary in/on the craft of your choice.